For weeks I have known that I wanted to write about this design and its origins, because it is my favorite Christmas stole right now, but I thought it was going to be a tribute to a friend who has joined the Church Triumphant. As the time approached for writing this blog, I realized that when I thought of that friend, I thought of another, the friend who first introduced me to Jesus. At that point, this blog took on a completely different character. First, let me tell you about Melody, who came into our Savior’s embrace on September 13, 2009. It was the second Sunday in September, the day that we always held our pancake breakfast for fall Sunday school kick-off. Before any of us got to church to begin preparing, I got a phone call from our secretary. The oldest daughter of the pastor had called her to say that none of the family would be at church, and asked that we pray for them, but did not explain. Soon we found out that the pastor’s wife, Melody, had passed away early that morning. There was no warning. There was no apparent cause of death. She was in her early 50’s. She was just gone. Melody was the nicest person I had ever known. She seemed to love so easily. Around her I felt accepted, as though she could know the worst about me and would still love me. It wasn’t like we “hung out.” Our families did not mingle. We sat next to each other in choir, and at high school football games, and we enjoyed each other’s company (probably a little too much in choir). With my history of chronic depression, I lived under a dark cloud much of the time I knew her, but Melody’s laughter was good medicine. Her joy simply bubbled over. Just her smile or the kindness of her voice was the ray of brilliant light that even my intense storms could not overshadow. Melody did not “mother” me, but her gentleness with her own daughters was a penetrating salve to my deep wounds. I remember once when her youngest daughter, who was a year older than mine, told her “You’re gross.” Melody just laughed, as though she enjoyed this teenager even in those ugly moments. At the memorial service, the same daughter ended her eulogy with “I love you mom. You’re beautiful.” The week following Melody’s death it was all I could do to tread water in the ocean of my grief, barely catching my breath. I wanted to work, to distract myself, but it was days before torrents of tears slowed to showers and then to drizzle. When I could finally see again, I began work on the earliest version of the Madonna and Child design, but I was still “sewing in tears.” I had planned the design before her death, so it was not inspired by that event. It was simply the next thing in my schedule, but it will always be tied to those days, weeks, and months when I felt the greatest loss I had ever experienced. Six years later I cannot make that design, or even see it, without remembering Melody, although the design has gone through several rebirths. I can still weep like the wound is fresh, but I also reap the joy of the memory of our friendship. This week was the first time my memories of Melody connected with my memories of Susan. I was 10 years old when I met Susan. My family had just moved from Denver to southern Missouri, running from the mistakes and evils of the past. We knew no one, and had no support. But God in His providence, knew that alone and vulnerable was where we needed to be for Him to reach us. The old couple who sold land to my mother and step-father invited us to the rural community church where Susan’s husband preached twice a month. At that point in my life, like Melody, Susan was the nicest person I had ever known. Susan brought groceries to our family when my step-father was out of work. She and her husband led my mother and step-father to a saving knowledge of Jesus Christ, and discipled them, sometimes late into the night. Susan’s house was a safe place for me to go after school, and it was during that time, when I was staying at her house for a few hours every afternoon, that she shared the gospel with me. I remember her showing me the popular gospel tract, “The Four Spiritual Laws.” She told me about her own salvation experience, and how it felt as though a weight was lifted off her shoulders when Jesus forgave her sins. She asked me if I would like to ask Jesus into my heart. I sensed that this would make Susan very happy. I wanted to make Susan feel happy, because she made me feel loved and safe. So I prayed the sinner’s prayer, and afterward, when she asked me how I felt, of course I told her I felt like a weight had been lifted from my shoulders. Maybe it had. I don’t really know what happened that day. I think that was in February, and I was baptized in an ice-cold creek in mid-April with my mother and step-father. But at home sin reigned. Physical, verbal and emotional abuse escalated. I did not know it was abuse then. What I knew was that I was the cause of the unhappiness. By personality I am a problem-solver. I have always taken known problems head-on, found the most obvious solution, and carried it through. I was not always successful; I was just a kid. I had tried running away twice, once when I was seven and again when I was nine, but found I was just not ready to live on my own, and returned both times. Clearly that was not an option. Of course I had TRIED to be good all the time, TRIED to anticipate what would trigger anger and outrage and retribution, but I had failed utterly at that as well. Time for a new plan. The seed was planted with warnings about keeping my toddler brother and infant sister safe. Warnings about household chemicals, and plastic bags, cords, and sharp objects. One day I asked, “Are there any household cleaning products that could kill someone?” Ammonia mixed with bleach, I was told. A few minutes, or perhaps seconds later, came the warning, “Don’t even think about doing something so stupid. You could hurt your brother and sister.” Good point. I would never want to hurt them. I loved them more than anyone or anything. They were precious. I was glad I had asked. I also knew I had better not ask again, but I was on the right track. The following three weeks were the happiest I had ever known. I was at peace. I had the solution; I just had to find the right means. My first attempt was with a Chinese jump rope, made from a long piece of elastic. It was easy to conceal in the living room/dining room/bedroom I shared with my brother in the camping trailer in which we lived. I felt a thrill when I wrapped it around my neck, even with my step-father in the room as he tucked my brother in for the night. But I just could not hold it there long enough. I did not have the willpower once I felt my air cut off. I tried a couple of nights, but I just could not do it. Then I heard that people pass out before they suffocate. I had fainted several times before, so that was not so scary. I hid a trash bag in my pillow case. I was going to stay awake until everyone in the trailer was asleep. But I fell asleep the first night, before I could carry out my plan. And the second night. The third night I set an alarm for 2 a.m. In my mind this was fool-proof. I went to bed with the conviction that I would never see another morning, that I would never make anyone unhappy again, that finally, my family would have the life they wanted. At this point in reading, you are probably laughing. Set an alarm in a camping trailer? And not wake everyone? The alarm did, indeed, wake everyone. Except me. In the morning, when my mother jostled me from my deep sleep, I was disoriented. Why was I still here? What happened? What went wrong? My plan was flawless. It could not fail. My mother’s voice, the morning routine of packing up the bedding in the benches we slept on, the morning sun invading the trailer, all was surreal. The light. God is light. Jesus is the light of the world. My brain was overwhelmed. I was paralyzed by the intense dissonance between what I expected and what actually happened. My body temporarily shut down as I processed a completely new paradigm. God was real. There was no other explanation. God was real and wanted me alive. No matter what, God wanted me alive. As I leaned against the bedding I was supposed to be packing up, I almost felt like I was out of my body, watching the scene. I could hear my mother’s questions about the alarm going off at 2 a.m., but I could not answer. Finally, she noticed me, immobilized, and asked, “Are you sick?” No. For the first time, I was well. God was real. God saw me. God knew me. God wanted me. God was real. I told no one about this for years, until it became part of my testimony at later youth camps. When it became more public knowledge, one parent declared that it would have been my final revenge. Not so. I nearly lost one of my children to suicide, so I understand the devastation that a child’s suicide brings on a family. One of my parents would likely have gone to prison, so unlikely is it that an 11 year-old’s suffocation is self-inflicted. I was not the only one God protected that day, but He knows I planned it for the good of my family, as twisted as that sounds. Perhaps sometime I will write about the years following. That moment did not fix my problems. The abuse got worse before it got better, and it endured even beyond my departure from that home. But I knew that God was real and wanted me alive, and that knowledge carried me through my remaining years with my family of origin. I experienced suicidal ideation again, decades later, especially after Melody died, when I wondered why God took her instead of me, when she was so good, and I was not. Yet it was the knowledge that God was real that prevented me from seeking that solution again. What a dark topic for Advent. Yet is it not in darkness that we have seen a Great Light? Is it not to people in darkness that we are supposed to carry that Light? To make God real to those who are in despair? Indeed, it was in Bethlehem over 2000 years ago that God became “real,” in a sense. Jesus came to show us, in a way that we could understand, what God was like. He told Thomas that those who had seen Him had seen the Father. Jesus came in “real” flesh, spoke with a “real” voice, and pointed to a different reality most were selling short. Susan, Melody, my husband, and many others have helped make God real to me over the years. As I honor Susan and Melody with this blog, I feel a calling on my life, a tug to examine: Do I bring Jesus to others? His gentleness, His safe acceptance, His loving laughter? Do I live as though God is real in my life? If you or someone you know is thinking about suicide, please find help today. If you suspect your child may be thinking about suicide, do not wait. Tomorrow may be too late. If you do not have a local resource please call the Hope Care Center at 1-800-488-HOPE (4673). 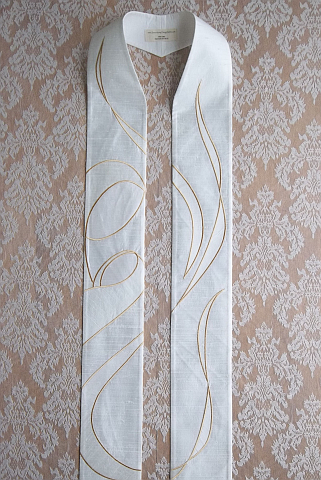 Serendipity Clergy Stoles is a one-woman liturgical art ministry, dedicated to glorifying God through original designs on high-quality stoles. Let my work support your worship! Copyright Serendipity Clergy Stoles. All Rights Reserved.